Last week, my friend Dan Klyn helped me to rediscover the work of Charles Moore. I bought Chambers for a Memory Palace in the 1990s but failed to make it past the first chapter. I’ll have to see if I can dig it out of the basement. In the meantime, I’m now reading and enjoying You Have to Pay for the Public Life. My favorite essay so far is Toward Making Places which Moore co-authored with Donlyn Lyndon, Patrick Quinn, and Sim Van der Ryn. This passage is particularly memorable. The user must be allowed to participate, to reclaim through his acts that which has been abstracted for him. 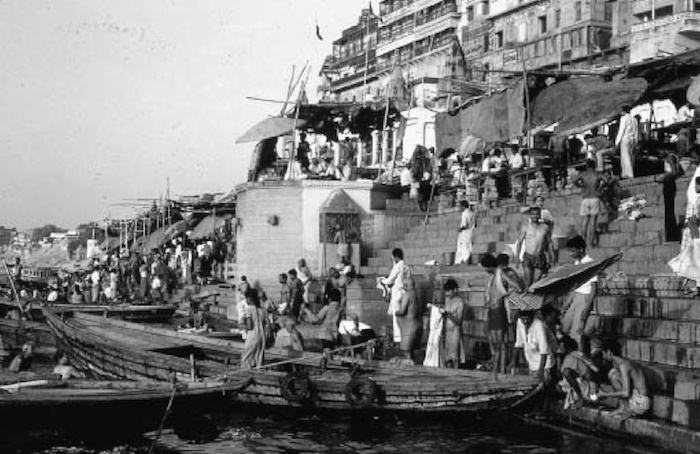 The ghats at Benares are the most striking example of this tension. As great cascades of steps they plunge out of the narrow streets and down to the sacred Ganges. As an edge to the river, their simple geometric forms indicate the annual rise and fall of the river and its tremendous importance to the town, providing with one gesture an infinitely adaptable base for activity. Each step is a potential place: place to worship, place to wash, place to sell, place to sign, place to sleep, place to die and be burned. Every day the people come to bathe in the hallowed water, to repossess the river’s edge. The steps remain, the act is daily repeated. Those of us who are making places with information might follow in these footsteps. To that end, I’ve added Varanasi and The Sea Ranch to my list of places I hope to visit. In the meantime, I’ll keep reading Moore while remembering that books are places too.